Cleanliness is next to godliness. A clean society leads to a healthy society. Therefore to keep your household, street, neighbourhood and city clean, hire Blue Heeler Bins, the best waste removal service in Loftus. Are you constantly struggling with getting rid of your rubbish? Whether it is your residential waste or commercial waste from your office or construction site, Blue Heeler Bins can help you make it disappear within no time. All you have to do is hire our waste removal service in Loftus and we will be there in no time to clean up your mess. Our experienced and qualified team of workers have been in this business for years. Therefore they know how to get rid of garbage efficiently and with ease. They are always on time and will provide their services with a polite attitude. You will never have to worry about garbage disposal problems anymore. Here at Blue Heeler Bins, we can provide you with bins of various sizes. We also have crane bins that can be placed with the greatest ease in any location. Our service area is very vast. Therefore we can provide you with our waste removal services wherever you may be located. Our services include cheap skip bin hire in Sydney as well as rubbish removal. So for any garbage removal needs you may have, you know who to call! If you are still not convinced about the exceptional services we provide, you can read the latest information on our waste removal services on our online blog. 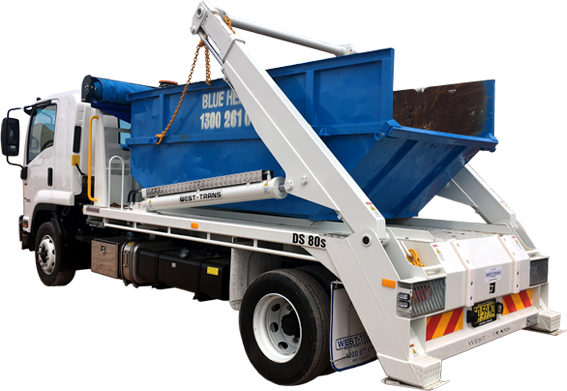 To hire the best waste removal service in Loftus simply contact Blue Heeler Bins today on 1300 261 041 or 0418 238 210. You can also contact us by sending us a message on our official home page.